Comic books have historically played powerful roles in promoting resilience: No matter how tough the going gets, the hero always manages to triumph. They allow the reader not only to enjoy the experience, but also to learn or be inspired. Military personnel who are deployed often commit with a deep internal sense of loyalty, service and social justice. Equipped with specialized training and equipment, they launch on missions hopeful that they might make a significant contribution, or be a part of meaningful social change. Trauma, for many, can occur when these service members are prevented from taking action in a meaningful or effective manner. In the worst case scenario, they are asked to do things that conflict with strongly held internal values. As a result, the internalized dreams of hero disintegrate and a darker self-concept of villain emerges. On returning home​, many injured members are hesitant to discuss or share the nature of their internal injuries. A divide is created between the injured member and those they are closest to. 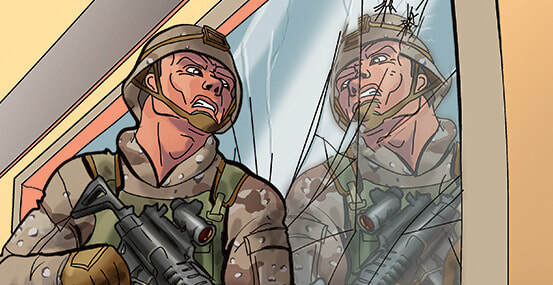 This comic book series is written with the explicit goal of assisting those suffering the effects of Operational Stress Injuries in recovering from these more invisible wounds. As our name suggests, PTSD Hero Comics deals with some pretty hard issues. In The Stranger Returns series, we touch upon conflict, physical and mental injury, and the suffocating sense of alienation and isolation that can result from these injuries.